Mineralientage München is the largest mineral show in Europe. Every year we at Crystal Classics put a little extra effort into our presentation in the premium area, right at the centre of the Mineral Pavilion. This year was no exception and we went that extra mile for our customers and friends. All the way from Somerset, England we carried more cabinets and more mineral specimens with us than ever before. in the largest ever booth we have ever had. A wet Tuesday morning greeted the Crystal Classics team as we entered the Munich halls. The Crystal Classic's banner towered above our booth in the centre of the hall. So we knew we would be visible from every corner of the A6 pavilion. It wasn't long before the team got stuck in. The setting up process is as normal but with so much more to do this year. It might look chaotic but don’t be fooled by appearances. The team all knew exactly what we needed to achieve and all worked enthusiastically to that end. 30 glass shelves and 20 doors had to be spotless - just in the back section of the booth, not to mention the wiring, lighting. Liz, Dave and Katrin wasted no time looking at the camera. Every minute was spent removing fingerprints while another team fitting the shelves simultaneously into the cabinets. The preparations for the show had begun weeks before the event. Because of the increasing scale of our displays, it has become necessary for each showcases to be prepared, displayed and photographed in advance back in Somerset. Here Peter made sure that everything was in it's right place in just one of the showcases. Details is everything at Crystal Classics. The final display - and this just the back of the booth! - "Fluorite", "Tsumeb Mine", "Gems", "Quartz", "America" and "Africa" etc. with exquisite selections of miniatures through to cabinet sized specimens suitable for anyprestigious collection. One of the finest examples of Tourmaline of it's type that we have seen. from the Antsikova Pegmatite, Manapa, Betafo, Antananarivo Province, Madagascar. Deep crimson red terminated crystals on matrix. Amethyst is well known from Brazil and commonly in association with Calcite. Here, a well developed Calcite crystal predominates over the amethyst and displays an interesting array of inclusions. From Rio Grande Do Sul, Brazil. A fine aggregate of twisting Chalcedony forming a an intriguing "arch" shape. From Jalgoan District, Maharashtra State, India. from Rapid Creek, Dawson Mining District, Yukon, Canada. from Machacamarca District (Colavi District), Cornelio Saavedra Province, Potosí Department, Bolivia. from a classic locality Greifenstein, Ehrenfriedersdorf, Erzgebirge, Saxony, Germany. large irregular shaped nodule of "Antique" Amber from the Baltic coast. this undamaged fine calcite specimen attracted a lot of attention. from Mexquitic, San Luis Potosi Mexico. Specimen acquired from the Jesse Fisher and Joan Kureczka Collection. Sar-e Sang, Kokscha Valley, Badakhshan Province,	Afghanistan. 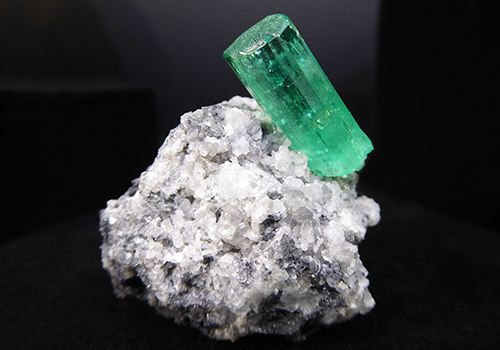 "Emerald" Specimens are a favourite in many mineral collections. This is a particularly fine and distinctly coloured hexagonal prismatic crystal, aesthetically perched atop it's mostly Calcite matrix. From Mun. de Muzo, Vasquez-Yacopí Mining District, Boyacá Department, Colombia. Our wooden drawer units were a popular feature at Munich 2014 and 2015, so we brought more this year. These units had minerals from various European countries including Germany, Romania, Czech Republic, Hungary etc. The drawers were packed with specimens so everyone would find that new special addition to their collection. not least from the guys at Blue Cap Productions who wanted to film for "What's Hot in Munich 2016". Ian talked about some of the interesting pieces we had on show. recently acquired from the Ukraine. A selection of these were on display in one of our show cases together with a range of new Tanzanian Chrome Dravite. Crystal Classics had the pleasure of holding a book signing event in our booth. "The Kalahari Manganese Field’’ A great read for those interested in south African minerals. but we have something for everyone. This young mineral collector enjoyed a few of our free drinks coasters. Munich 2016 was special in so many ways, not least because we had an extra team member working with us. Veronica speaks 8 languages and her translating skills were well appreciated. A view of nearly the entire A6 hall which hosted almost 200 exhibitors. It took some time to have a good look around and take everything in. The theme for this year's show was Museum’s hidden treasures. The Natural History Museum in London exhibited one or two fine specimens including this Siderite ‘"Box". The box is actually an epimorph (overgrowth) after a Fluorite crystal that has subsequently dissolved away leaving the hollow box. A very collectable item well known from the Virtuous Lady Mine, Buckland Monachorum, Tavistock	Devon, England. which are illustrated in the engraving at the back of the showcase. in helping us to understand modes of formation and geological conditions at the time of formation of the crystals. Dave is also treasure hunting but maybe for something much more affordable than museum pieces. Note the colour /growth zoning in the Ruby. Each year in Munich there is a display of Alpine minerals, held in one of the adjacent halls. the theme of this years display was Ticino - an area of the Alps that has become famous for it's fine Quartz specimens. One of the fine specimens of Hematite that the exhibition had to offer. But this piece had a hidden treasure. Not really visible in the image there was a tiny Bazzite crystal attached. Bazzite is a rare Scandium Beryl. From Fibbia, Fontana, St. Gotthard Massif, Leventina, Ticino (Tessin), Switzerland. Also on display, this stunning specimen of Rutile in Quartz from St. Gotthard, Leventina, Ticino (Tessin), Switzerland. coating of dark green Chlorite scattered across the back of the specimen. Very pleasing to the eye. A closer look at the specimen pictured previously. Very colourful exhibition of non-mineral collectable items. A rainbow displays of snuff-glasses with mining themes (circa 1900). Mineral collectors could find all sorts of items to please their eyes. Who wouldn’t like to have a polished malachite elephant? Something completely different in form and shape. The clockmaker M. K. Braun from Switzerland combines mineral specimens with very traditional clocks. The Munich show is almost finished so we can all celebrate the success. The entire team (almost, not all came to Munich) who worked so hard throughout the entire week. We were all responsible for different parts of this huge project. Starting from the left: Dave, Sabine, Mal and Angie, Dave and Liz, Martin, Diana and Ian, Debbie, Wayne, Katrin and Peter, Veronica, Dan, Chris and Shayne. We should also mention Holly who designed all the artwork, banners and leaflets and the other members of the team Ali, Steve and Martin who had to remain in Somerset to keep the offices running during our stay in Munich. There is also one person missing - the one behind the camera: Olga. many, many wonderful guests, customers, visitors and friends. 7 unforgettable days in Munich.